We’ve been doing our website reviews for quite some time now. Over the past years, we have reviewed more than 1,700 websites (!) and counting. In this article, I’d like to show you how our reviews can help your website by highlighting some of the recommendations and how the follow-up on that resulted in increased traffic and sales. 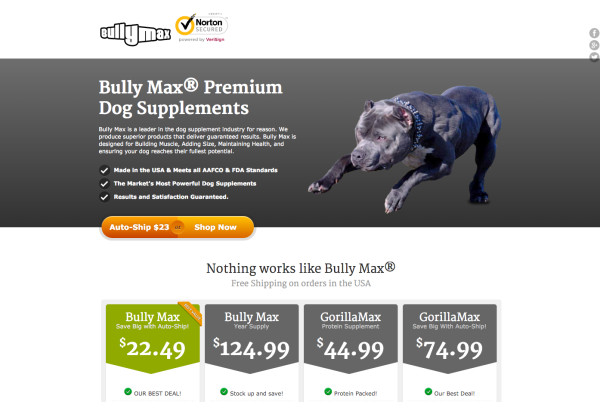 Bully Max is a very loyal customer of ours, that is using a lot of our products (far more than just the website audits). Let me demonstrate how our reviews have helped them grow their business. The website had a lot of potential, with the company being in a clear niche market and having a very passionate team that was willing to go the extra mile. As there is always room for improvement, they asked us to do a website review for them. The website had a slider, which we disliked then as much as we do now. Sliders often cause distraction from the main element of your (home)page. This could lead to a very noticeable lack of focus. There was simply too much going on. Create trust, great call-to-action. 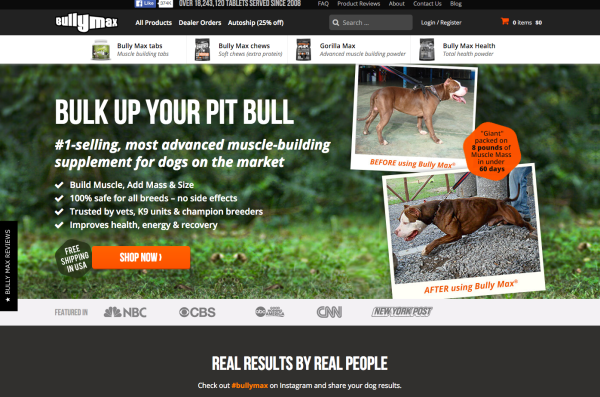 Remember that these vitamins for pitbulls are a rather emotional product. We’re talking about your pet here and you only want the best for your pet! Once the website has convinced you about the products, there is a clear call-to-action to go shop for your dog’s vitamins. No doubt about what the visitors should do here. Much improvement when it comes to focus. 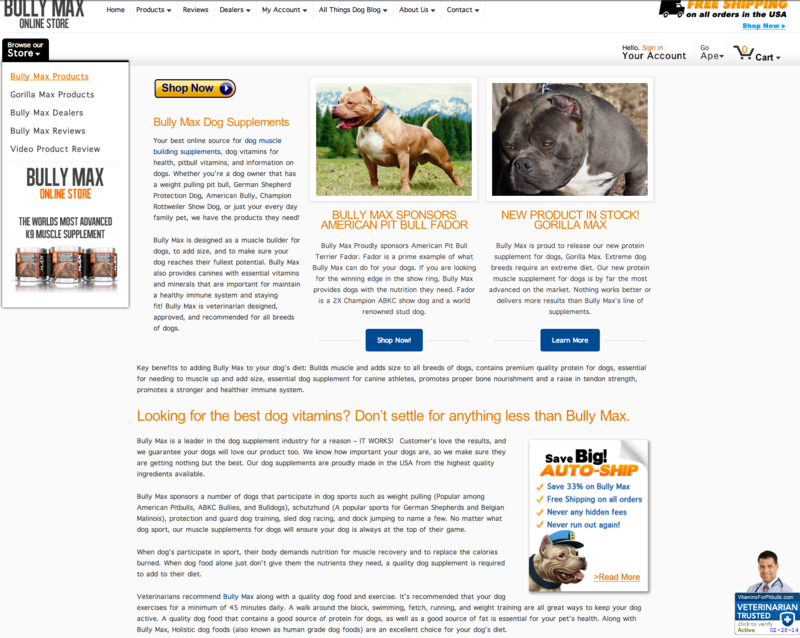 Please note that Bully Max shifted the main product area to bullymax.com, where we reviewed the original domain of vitaminsforpitbulls.com. That website still exists, but links to the brand domain for products and more. Activities shifted from one to another website, visibility still increased for the old domain (nice job). Of course we found more on the initial website. Looking at their product pages, we found the product descriptions were all duplicate. If you own a webshop and you’re selling products that others are selling as well, here’s an invaluable tip: write your own content. No matter how awesome your website is, you just won’t rank for your product descriptions if there are 500 other webshops with an exact copy of that description. Webshop owners often simply use a manufacturer’s description, for instance. This inevitably leads to duplicate content. As I bet some of you know, we are unforgiving in our review. The final report consisted of almost 6000 words of critique. And Bully Max was ecstatic. They simply understood the value of all that we had to say and got to work. You just got to love customers like that! 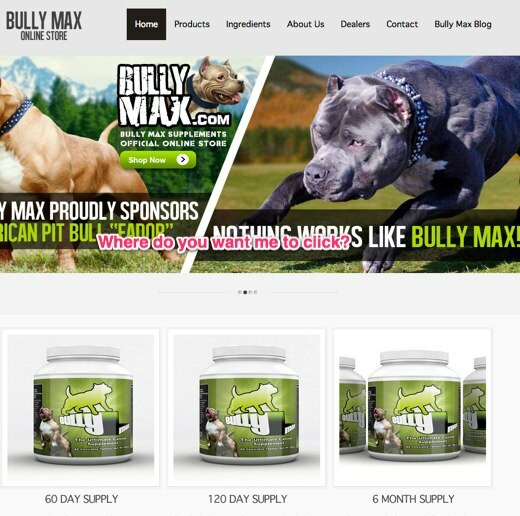 The increasing visibility for both websites, and the extra traffic that comes along with that, is the result of hard work on the side of Bully Max. And the willingness to take on our advice and trust what we had to say. Back in 2014, we felt we could share more knowledge about conversion as well. Before releasing the Conversion review, we held a trial among our website review customers. That way, we could perfect our product before making it available to the masses. Literally within 10 minutes of sending the mail, Bully Max replied that they wanted to buy the Conversion review. They were very eager to try out this new product. We obviously were very happy to have such enthusiastic and hard-working customers for our first Conversion review. Bully Max added loads of content. They did a great job improving the website, and we noticed. As I mentioned earlier, there is always room for improvement, there are always some things that can be better. Their main conversion issue, which was most probably costing them sales, was their website’s responsiveness. Their website was less suited for a mobile device and to be honest, their mobile website just didn’t work at all. And that’s a big flaw, if you consider the fact that almost 50% of their traffic came from mobile. These days, with Accelerated Mobile Pages being a hot topic, most website owners understand the need for a great mobile/responsive website. That has changed a lot over the past two years. Having said that, we still see our share of websites that are just not optimized (enough) for mobile users. If a theme is responsive, that doesn’t mean all your content is. Videos or images that just don’t scale are rather common. Don’t just believe your web developer created a mobile website, but visit your website from a mobile device from time to time, to check if all of your content nicely scales as well. What I really like about Bully Max, is that while a design improvement is rather easy to do (switch theme, change some CSS and images, things like that), the Searchmetrics.com chart above shows that Bully Max continued to focus on content as well. The homepage ranks for these keywords, but well, that is just what we mentioned in our post about branding. These are the increases and decreases in percentages. I’m already hearing you say: “but the average order value went down!”. Yes, it did. And that’s the only thing that went down, and not even significantly so. For the non-believers out there: the sales weren’t low to begin with, so these percentages really do mean something. Todd Jirecek, Director of SEO, Bully Max Inc.
As we’ve tried to show you in this post, both our website reviews and our conversion reviews can have a major impact on your business. Note that our current Diamond review combines all of this. Please note this doesn’t just happen like that. We can’t emphasize this enough: you have to work really hard at it. These audits will do nothing for you if you’re not willing to sit down and get cracking on your website. If you really put some effort in it, our reviews will have a lasting effect, as this Bully Max case shows. By the way, please don’t make the mistake of thinking that SEO, or Conversion Rate Optimization, is a ‘trick’. There are no settings you need to tick or untick to make your website rank or sell better. It requires genuine effort. And the payoff will taste all the sweeter for it, so go optimize! What do you think? Are you ready to optimize?